Wesley Hamilton is the very definition of turning a bad situation into one that deserves a Lifetime movie, and his is just getting started. Injured in a gun violence incident 6 years ago, he has found himself since his injury. Not only did he transform his body after his accident, Wesley went on to start a nonprofit that is helping do the same for others with spinal cord injuries. But that’s just a couple of the amazing things he’s done since becoming paralyzed. Motivating others through speaking, to people who are both disabled and able-bodied, is another one of his passions and it’s beginning to get him noticed across the country. See how his story is unfolding and why Wesley is a positive spirit you‘ll never forget below. Growing up on the Eastside of Kansas City, Missouri, Wesley was going along living his life when everything changed in 2012. Shot multiple times by someone he didn’t know, he found himself paralyzed at age 24. Wesley was a new single father with sole custody at the time, and at 230 pounds and 5’4, his body was not suited to being in a wheelchair 24/7. Inevitably, two years after being paralyzed, he developed a serious bed sore that required surgery. Weight was always something he always struggled with; he was never an athlete. Luckily, he had healthcare workers who inspired him to lose weight. Once he learned about protein and taking up a weightlifting regimen, he was off. He even studied to become a dietitian and now eats a Vegan diet. Wesley in total lost 100 pounds. After losing the weight, he felt so inspired that he wanted to share the power of taking control of your health & weight with others with paralysis. This is why in 2015 he started his nonprofit, The Disabled But Not Really Foundation, to encourage people with SCI to exercise no matter their ability. Wesley is also planning on getting his certification as an adaptive CrossFit trainer. And he has really taken off physique-wise (he is now a wheelchair weight lifter and competes in muscle competitions), but the way The Disabled But Not Really Foundation has also taken off is what really motivates Wesley. His foundation is helping people with paralysis get in shape and it’s also helping the wider community, like the homeless with their “Hydrate the Homeless” program. 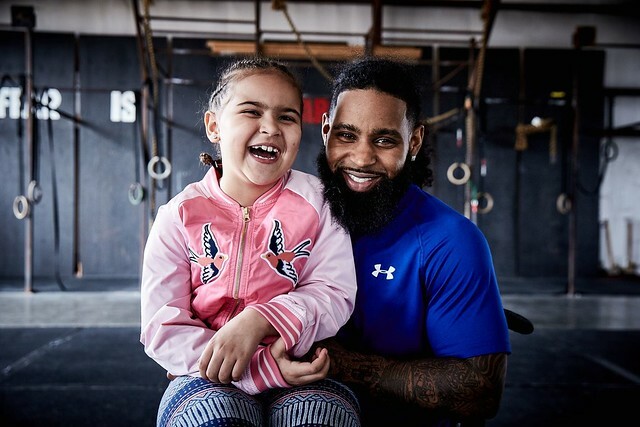 In his downtime, other than being a dad to stay busy, Wesley is a motivational speaker and speaks to high schools, special-ed classes, businesses and to the world through his video channel. He loves to speak on believing in yourself. “I wake up everyday and love myself,” he says. His confidence truly has the ability to instill the same in his audience. Wesley also speaks about the power of finding courage, overcoming obstacles, never giving up, and one of our favs – creating positive energy. “If you surround yourself with positive energy, great opportunities will come your way,” he says. It has certainly worked for him. Late last Fall (in November, 2017), his story was featured in Men’s Health Magazine. And his introduction to the world continues. In January, Wesley won $18,000 at WeWork’s Creator Awards Event in NYC. He was honored with their Community Giver Award; a really awesome award. And he also was featured in Ebony Magazine in February 2018 for his foundation. Currently, Wesley is focused on his foundation’s current challenge, #HelpMeGetFit, where they plan on helping transform the bodies of four people with SCI this year. Such a great idea for the community! They’re currently searching for participants in the Kansas City-area. To contact Wesley, click here. This entry was posted in SCI Superstars and tagged disabled but not really foundation, kansas city wheelchair help, wesley hamilton, wheelchair health fitness training, wheelchair weightloss on February 26, 2018 by Tiffiny. We’ve been closely monitoring spinal cord injury research and the future is brighter than ever for real treatments for paralysis. While stem cell research is the first thing that comes to mind when many think of SCI research, it is no longer the ruler of the roost. Many other treatments and studies are providing just as much hope, and we’ve outlined our favorites below. 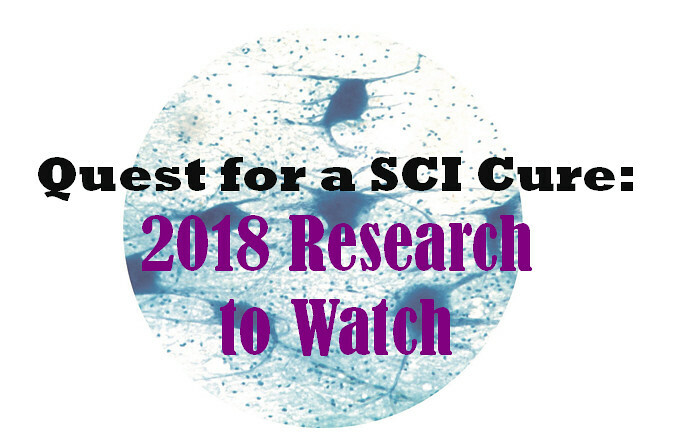 From a new antibody treatment that limits neural damage to gene therapy that can break down scar tissue, read on for the most exciting SCI research in 2018. Activity-based therapy has been the real hope of the spinal cord injury world for the last few years, and for good reason. This research is showing real results in humans. It works by electrically stimulating the spinal cord via an implanted simulator, and overtime many people with paralysis report real return from the stimulation. Bladder, bowel and sexual return are the most common functions people are seeing. Some leg movement, and the ability to stand is also being reported. The University of Louisville Kentucky, where this research was originally discovered, is launching a new human trial for 2018. This new study is seeking to recruit 36 participants. Learn more here. In addition, two other epidural stimulation human trials that are currently ongoing, the Mayo Clinic and the University of California, are ending this year with further positive results expected. Not too long ago Stephen Strittmatter, a Yale professor, discovered and developed a molecule that can block three different inhibitors, stabilize the nervous system and promote nerve regeneration. He also created an injection with the molecule and tested it on injured animals. Within three months, a third of regained full mobility. So motivated by the results, Dr. Strittmatter formed a bio company called ReNetX Bio. For over 20 years Dr. Jerry Silver of the Silver Lab at Case Western University has been researching the role of glial cells and the regeneration of nerves. He’s also done extensive research on those with chronic injuries combining Chondroitinase with peptide (a protein) to dissolve/neutralize the axons that creates the scar over the injury area. We’re seeing some exciting additions to the possible cure for paralysis in recent years. It really is remarkable. From 2018 and beyond, we can’t see what happens next. Check in with us as well as the year progresses for updates on the above research as it it released. This entry was posted in Feature stories and tagged asterias biotherapeutics trial, catwalk organization, Chondroitinase, epidural stimulation, gene thereapy, lamprey spinal cord injury, neural stem cell graft, renet x, spinal cord injury research on February 16, 2018 by Tiffiny.